ERP Replacement Lid / Door Switch Kit commonly used on Whirlpool, Roper, Estate, KitchenAid, Maytag, Sears Kenmore brand washing machine and clothes dryer models. 279347, 344475, 687428, 3388222, 661517, 3391839, 660308, 4319330, 3392266, 296141, 3397503, 687429, 3347287, 359230, 388322, 364090, 364091, 367034, 233480, 235462, 237194, 238980, 239868, 24198, 247207, 279290, 3406, AH334185, EA334185, PS334185, 287220, 291679, 291697, 292212, 296144, 338883, 3399991, 350526, 359484, 389105, 83333, 84144, 99788, 347207, 75958, 86628, LP210, 2-5415, 8224, 287219, 89556, 238775, 202770, 205415, 250062, LP210. The lid switch is a safety feature that was added after people suffered serious injuries for reaching into operating washing machines. 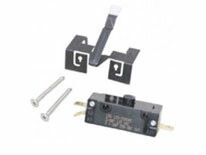 Switch Kit can be used on older dryers as a door switch or on washers as a lid switch. Kit includes switch, lever, screws and wire terminals. For lever only order please ask.